The ravages of colonialism cast a dark shadow over the South American landscape in EMBRACE OF THE SERPENT, the first film shot in the Amazonian rainforest in over 30 years. 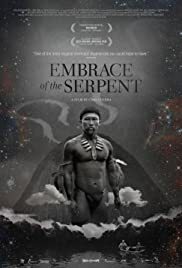 Filmed in stunning black-and-white, the film centers on Karamakate (portrayed in various stages by Nilbio Torres and Antonio Bolívar Salvado), an Amazonian shaman and the last survivor of his people, and the two scientists (Evans and Theo, portrayed by Brionne Davis and Jan Bijvoet) who, over the course of 40 years, build a friendship with him. The film was inspired by the real-life journals of two explorers (Theodor Kock-Grünberg and Richard Evans Schultes) who traveled through the Colombian Amazon during the last century in search of the sacred and difficult-to-find psychedelic Yakruna plant.